IHA upgrades its DSNG encoders and decoders with ATEME. 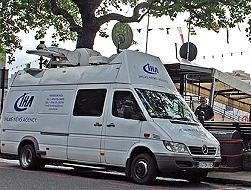 Paris, February 2016: ATEME has announced that IHA Broadcast Services, Turkey’s leading news agency, is deploying the Kyrion encoders and decoders to upgrade and extend its flyaway and DSNG fleet. Based on the ATEME fifth Generation STREAM compression engine, the Kyrion encoder and decoder provide the best baseband video quality at minimum bitrates. This solution has been designed for contribution over satellite and IP networks, with added value features such as ultra-fast-boot, ultra-low latency, and ABR output.